After you install Aimersoft DVD Creator for Mac, just follow the tutorial below to burn videos to DVD on Mac. If you are a Windows user, please go to Win version tutorial. Download and install Aimersoft DVD Creator for Mac. Then launch it and select Create a New Project to create a new DVD from your videos or choose Open an Existing Project to continue making the project that haven't been finished last time. Drag and drop the files you want to burn directly into the program, or just load them from the iMovie, iPhone, iTunes, etc. on the right Media Bower. All loaded files will be shown in thumbnail in the file list. You can merge, split or rearrange them by dragging and dropping the thumbnail freely according to your preferences. 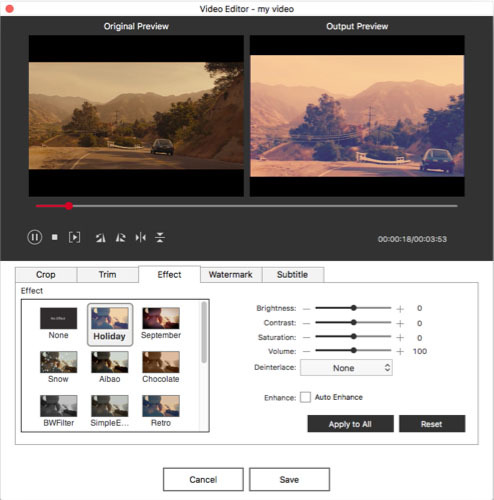 Edit function is available to both videos and slideshows. Highlight a file and click "Edit" to enter the edit interface. 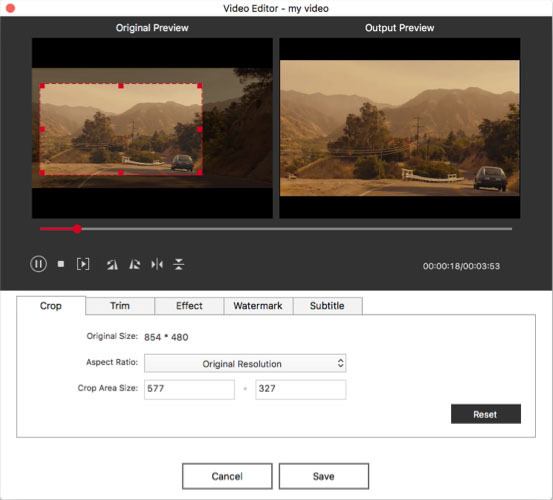 For videos and movies, you can crop, multiple trim, adjust effects, add watermarks and rotate them. For slideshow files, you can set the transition effects, add text and background music to make them more personalized and eye-catching. Tip: There are over 50 different slideshow templates for you to choose from. Click the "Menu" button on the lower right bottom of the main interface to enter the menu editing window. Choose a template among the preset animated or static templates. For animated templates, you can freely change the title miniature and edit the background pictures and music with your iPhoto and iTunes by clicking the "Advanced Setting" button. For static template, you can customize the frame, the play button, the video name, the background picture and music of the DVD menu. You can freely decorate your DVD menu with your own files from iPhoto or iTunes. Tip:This step is not so necessary if you are just an average users who don't have special requirements for the DVD decorating. 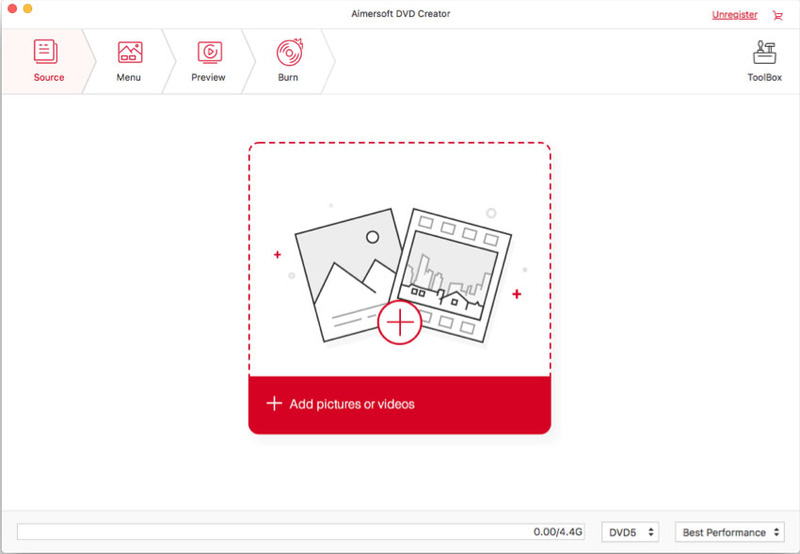 Aimersoft DVD Creator for Mac provides four output choices: DVD, ISO file, DVD Folder (Video_TS) and .dvdmedia file. Choose an output format according to your own needs and set the proper output parameters to start burning your files.